I advertised all the interfaces in the correct OSPF areas with the exception of the loopback0 interface on R1. This interface is redistributed into OSPF so it becomes a LSA Type 5. A type-3 default route generated by an ABR into its directly attached totally stubby area is an exception to the no LSA type 3 rule. This is the only type-3 route allowed within an totally stubby area. Rene’s lesson on types of stub areas very clearly indicates the functionality of each. You can find it here. However, I’ll try to give you a quick summary of why you would use each case in a real life scenario. A stub area would be configured if a network segment had only one choice for routing all traffic. An example of this would be a branch office that has only one gateway. There is no need for LSAs of type 5 to be advertised within this network since all routes will point to the local default gateway. OSPF is our “campus” network. Area 0 is the main network, area 1,2, and 3 are branch offices. 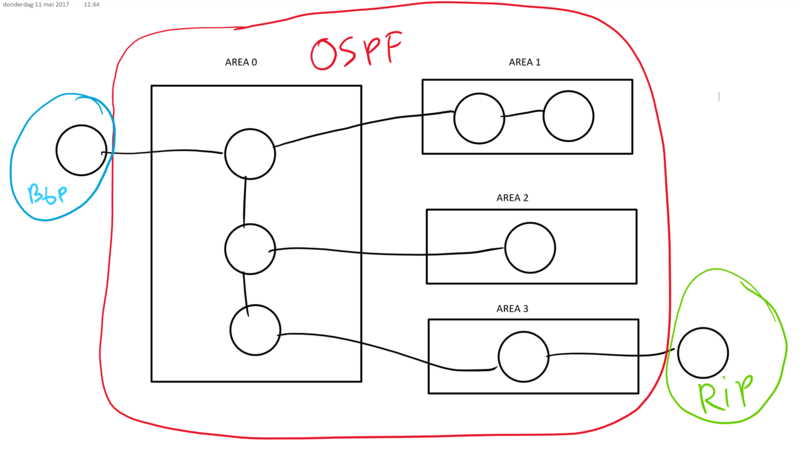 BGP routes are redistributed into OSPF, RIP routes are also redistributed into OSPF. I have to see if we can convert the router names in the forum too, it can be difficult to follow some old posts here now. If you run into anything, let me know and I’ll fix it ok?